[Don] uses a Continuous Glucose Monitor to stay on top of his diabetes. It means carrying around an expensive and fragile device which acts as the readout. He’s an active guy and doesn’t want to destroy the thing while dirt biking or kick boxing so he’s been trying to use a TI Chronos smart watch as a display alternative. As you can see he has already made some headway. This image shows the watch displaying data from the device. Unfortunately he’s depending on a PC to interface with the CGM display, then pushing it to the watch. He may try moving to a Raspberry Pi to help make this more mobile. This way the sensitive hardware could be tucked safely in a case inside a backpack while the watch shows his current glucose levels. We’d also love to see an embedded solution that would emulate the communications the PC is using to harvest the data. If you’ve got any suggestions in this area we’re sure that [Don] would appreciate the help. If the Pebble smartwatch can’t poll the monitor on its own, the Agent smartwatch will be able to. I think the limitation in this case is the TI watch. Really? The Chronos is completely reprogrammable – unlike the Pebble – so definitely isn’t the limiting factor. The Agent looks to be easier to program (C# and .NET microframework rather than low level C for the MSP430-based Chronos) but that won’t be out for a while. I’d say the step that’s needed now to cut the PC out of the loop is interfacing the glocose monitoring device to a suitable RF transceiver. You get a suitable USB one with the watch (433, 898 or 913MHz) but the ICs are also available if making some hardware is an option. I’ve got a Chronos and do some simple MSP430 coding but not actually developed on the Chronos. The guys over at 43oh.com would be your best bet for some help on this. That’s cool, didn’t realize it got moved to 2ghz with the new version. You should be able to record the values throughout the night from the TI Chronos with Lucid Scribe. It would be interesting to see if there are any patterns related to the sleep cycles. It’s all very nice these watches, but the real problem with most people is the price of the sensors. Like 100 USD for a sensor that last you 7 days. This is only for people who otherwise would die without it. Most of us cannot afford this. It is more important to find an alternative for these sensors. They’ve canceled a project with a watch which looked at your blood with a laser through your skin and displayed your glucoselevels on a watch. If that project could be fixed it would be great. But it would also mean supliers don’t earn as much. Agreed this is for type 1 diabetes and not type 2 unless your DR prescribes it and your insurance covers it. and 7days is the best case. Most can only last 3 to 5 days. And is really supposed to be used with a insulin pump. I do agree that this is a neat hack and is a nice to have option. Just as a point of note, I have this device and have used it fulltime for a year. The sensors technically are rated for 7 days but easily last 14 and as much (in my personal experience) as 25 days. They are worth the money and I pay it happily. How do you get the adhesive to last that long? Tegaderm? Yes, exactly, from day one. If needed I will add multiple ones. Keeping it right and dry is important to get them to last. Do you recycle the sensors in some way (e.g. send back to the vendor)? Or just throw them out? Recycle like reuse to use them long? I just stop and start the sensor again. When they are used up, I put them in medical trash. I don’t think you’re familiar with the relevant laws, because this is not illegal. I wonder if more common TI Heart monitor watches use the same approach to send data, could be fun to send false signals to someones watch. So to make the TX end small you can get a TI dev kit for the cc chip in the watch. They are tiny and can do what he needs with out a pc . Heh, interesting, both devices use TI CC chips, just on different frequency bands. If the protocol isn’t too complicated one could get away with a RX chip for the sensor signal, a microcontroller and a TX chip that relays to the watch. article is confusing, I cant tell when he talks about tablet like LCD display module, and when he talks about the actual CGM dongle. Hey, I’m a C# developer, I own a DexCom g4 AND I have a TI Chronos. We might be able to collaborate. Email me. I suspect much if not all of these issues could be solved with the new Sony android watch, provided you can send data via Bluetooth. Like is right though… sensors are the bottleneck. Has he fixed the fact that the TI watch cant keep time? I love the concept and the MSP430 but TI’s code is horrid at best and the watch is not a watch. it has no time keeping ability in hardware so it drifts so badly that as a watch it’s useless unless you time sync it daily. The chronos can be very accurate, over at watchuseek.com they have a new firmware for it (Feb 2012). You just track temperature changes on the watch for a month to calculate drift, put the numbers back into the new firmaware and some are getting 4 spy accuracy with it. check the openchronos-ng project http://sourceforge.net/p/openchronos-ng/wiki/Home/ the guys there rewrote the clock code to use the internal RTC instead. I think TI updated the firmware. The watch used for this project, 2 months old, keeps good time. Matches my PC after a couple of weeks. I’m pretty sure the G4 uses ANT+ to transmit data, which is closely related to Bluetooth. It’s a different protocol, however. If anybody has any ideas on how the Transmitter ID is related to the ANT code, I’d be all ears. The TI watch can keep acurate time if your willing to change your firmware, there is a great thread over at watchuseek.com where they are getting 4spy accuracy out of the TI. This watch is a great invention for diabetic patients but a number of people do not afford it. Don is lucky. The problem with sensor longevity isn’t the battery life, it is the fact that it relies on a chemical reagent to react with glucose in the body to produce a small electric current. Even with the transmitter recharged, the current detected for a given glucose level drops over time, until eventually the sensor needs to be replaced (seemingly anything from 3 to 30 days, depending on the person). @jcostik – dexcom g4 to android to pebble watch. Everyone here seems to be forgetting that wat actually makes this sensor so great is the algorithm in the pump/receiver that convert the little pulses to any meaningfull value regarding blood sugar level. The sensor and transmitter itself is not sensing the BG, the sensor and pupm/receiver together deliver this. Just wait for the G5; it’s supposed to offer open wireless connection, with the data processing part inside of the transmitter! Don, I’d be really interested to find out more about this and work with you on it. My son has T1 and it’d be great to get data from his pump / transmitter into our room at night. I work in Electronics R&D. Please email me. Hi. I’m interesed in getting the dexcom data to an android device – smartphone probably – so that it can be redesigned for use by reactive hypoglycemics. It’s currently optimized for diabetics. If someone is into that, drop me a note! You will want to check out the Nightscout project. 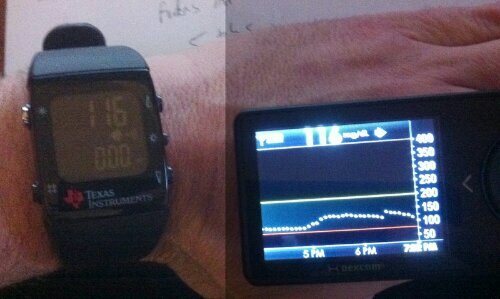 I just want to get BG readings from the dexcom that is hooked up to a raspberry pi. The database and all services requrired can be run right on the pi and it would make it cheap/portable. Can anyone help me? Is there a usb driver and perhaps API already for the device? I assume so since the nightscout project connects the cmg to the android device (which obviously is linux based). Please advise if you can.